The program that you made today used many concepts that you may not have seen or heard about before. In computer science, you learn programming concepts, like what specific blocks do, but also, new ways of thinking and solving problems. You had to think through some tough problems, when you sequenced code between two sprites. And when you figured out how to use two loops inside each other to program the wave effect. This type of abstract thought is very difficult at first, but through practice and persistence, it becomes much easier over time. Learning computer science will teach you how to code things like apps, animations, websites, and machines, and it will also teach you new ways of thinking. Knowing a little computer science empowers you to create wonderful things, solve problems, and understand how the technology around you works. Check out how these high school students used creativity, problem solving, and a little computer science to help their community. We surveyed people and asked them what they thought about their community trash and what they thought about graffiti in the community, and most people said that it was a big issue, so we wanted to fix that. So we decided to code an app that would help people get together and clean up their community. What the user does is they take a picture of a site where there's something that needs to be cleaned up, and community members can help clean it up. It's actually pretty easy, and it's fun to take on a challenge. To continue to learn more about computer science, you can take part in a local CS First club or try to get one started at your school, library or community center. It doesn't take a computer science teacher to run a club, so if you want to create one at your school, you can even offer to run it yourself. If you want to explore the materials outside of a club, go to the CS First website. And pick a theme and project that looks interesting to you. Beyond Google CS First, you can study computer science in high school, college, or even on your own. Large companies like Google, and even small companies in your community need people with creativity, persistence and computer science skills. 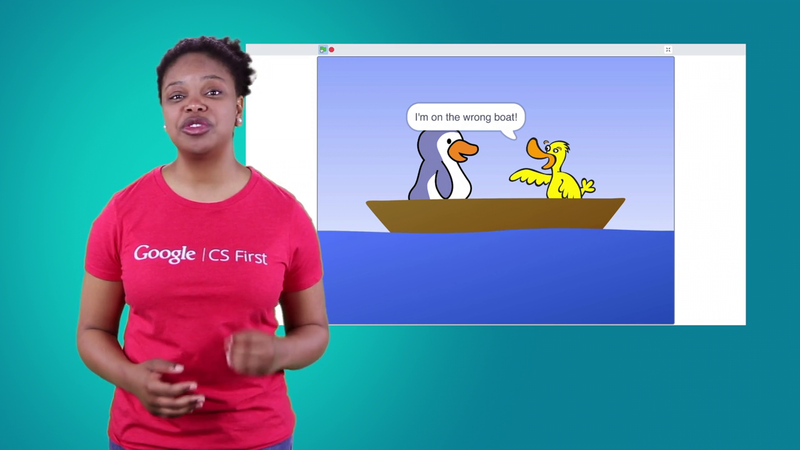 If you liked what you did today, talk to a teacher about starting a free Google CS First club at your school. Watch this video to recap what you worked on in this activity.